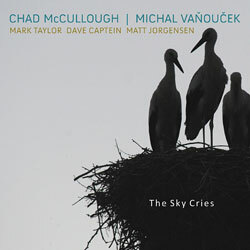 Seattle trumpeter Chad McCullough joins with Slovakian pianist Michal Vanoucek for an album of varied sonic landscapes and ever-changing moods. The Sky Cries follows up on concerts in The Hague (Michal’s home for the last decade) and the Pacific Northwest, where together they molded their music into something distinctly their own – blending modern jazz (“Where The Sky Cries” and “Blue In Breed”) with European influences (“Time-lapse” and “Krasna”) and an openness that is decidedly Northwest (“Urban Grassland” and “Soliloquy for D.G.”). They’re joined by saxophonist Mark Taylor, Dave Captein on bass, and Matt Jorgensen on drums.